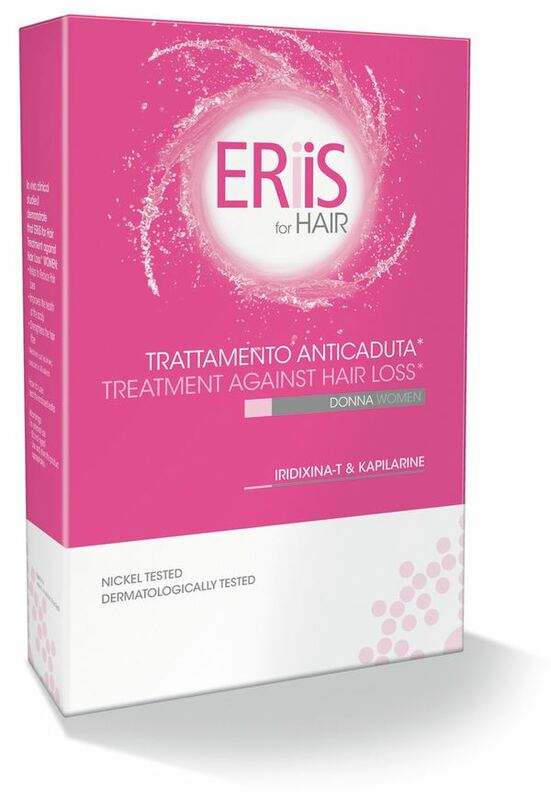 Hair loss treatment with Iridixina®-t & Kapilarine®. Designed for the specific needs of women's hair, this treatment helps strengthen fragile hair that tends to fall out. For weak and thinning hair. Guarantees rapid, visible results and is easy to use. Its extra-delicate formula is suitable for all hair types. Completes and optimises the efficacy of ERiiS® Treatment against Hair Loss. Nickel tested, dermatologically and clinically tested. A blend of sulphur-linked oligosaccharides of vegetal origin with low molecular weight. It regulates the life cycle of the hair: it prolongs the length of the Anagen (growth) phase and reduces the duration of the Telogen (resting) phase. It improves the condition of the scalp. A vegetal complex containing the extracts of 4 plants – Kigelia Africana, Gingko Biloba, Salvia Sclarea (Clary), and Cinnamon Zeyalanicum (cinnamon) – that act in synergy to restore the right balance to the scalp. It revitalizes and hydrates the hair. Other active ingredients that stimulate cell regeneration, restructure the keratin and generally improve the health of the hair. 40 volunteers applied the vials for 60 days. A statistically significant improvement in the hair resistance to traction after 30 and 60 days of treatment. A statistically significant decrease in the number of hair lost during the washing after 30 and 60 days of treatment. At the end of the period of the clinical trial the volunteers expressed their opinion about the efficacy and the pleasantness of the treatments. 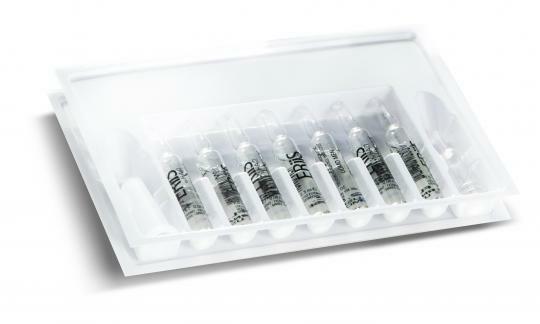 Apply the appropriate "open-ampoule" placed into the tray on the top of the ampoule. Break the neck of the ampoule at the white notch. Insert the dropper applicator, the treatment is ready for use. Apply treatment on the hair root by dividing them into sections and distribute the liquid to cover the entire scalp. Massage the scalp for a few minutes by insisting on the areas most affected by the hair fall. Do not rinse and proceed with the usual styling of the hair. The treatment can be used both on dry hair or wet hair. apply the contents of one vial every other day. The duration of treatment depends on the results obtained. It is recommended that a cycle of at least 3 months. It is recommended to repeat the treatment twice a year (spring - autumn). INCI: AQUA (WATER), ALCOHOL DENAT., PROPYLENE GLYCOL, DIMETHYLSILANOL HYALURONATE, ASCOPHYLLUM NODOSUM EXTRACT, PANTHENOL, GLYCERIN, PHENOXYETHANOL, BIOTIN, KIGELIA AFRICANA EXTRACT (KIGELIA AFRICANA FRUIT EXTRACT), MORINGA PTERYGOSPERMA EXTRACT (MORINGA PTERYGOSPERMA FRUIT EXTRACT), GINKO BILOBA EXTRACT (GINKO BILOBA LEAF EXTRACT), PPG-26-BUTETH-26, SALVIA SCLAREA EXTRACT, CINNAMOMUM ZEYLANICUM EXTRACT (CINNAMOMUM ZEYLANICUM BARK EXTRACT) PEG-40 HYDROGENATED CASTOR OIL, PARFUM (FRAGRANCE), METHYLCHLOROISOTHIAZOLINONE, TETRASODIUM EDTA, METHYLISOTHIAZOLINONE, DMDM HYDANTOIN, CITRIC ACID.